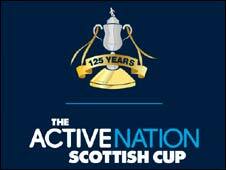 Albion Rovers progressed to the fourth round of the Scottish Cup courtesy of Marc Pollock's solitary strike. Pollock had an early shot cleared off the line by Paul Kaczan after Elgin keeper John Gibson spilled a cross. David Gormley was denied by the woodwork from Ciaran Donnelly's corner as Rovers continued to press for the opener at Cliftonhill. But they made the breakthrough in the 62nd minute when Pollock fired home after Gormley's clever lay-off. Albion: Gaston, Reid, McGowan, Donnelly, Benton, O'Byrne, Boyle (Stewart 62), Tyrrell, Gormley (McCusker 72), Pollock (Walker 86), Strachaen. Subs Not Used: Ferry, Ewings. Elgin: Gibson, Dempsie, Inglis, Kaczan, Edwards (Crooks 77), Niven, Gunn (Cameron 83), MacAulay, Frizzel, Nicolson, Tatters. Subs Not Used: Calder, McLeod, Robertson.